Roasting can be so much fun. You can try with seafood, corn, chicken, lamb, paneer (cottage cheese) and the list goes on. 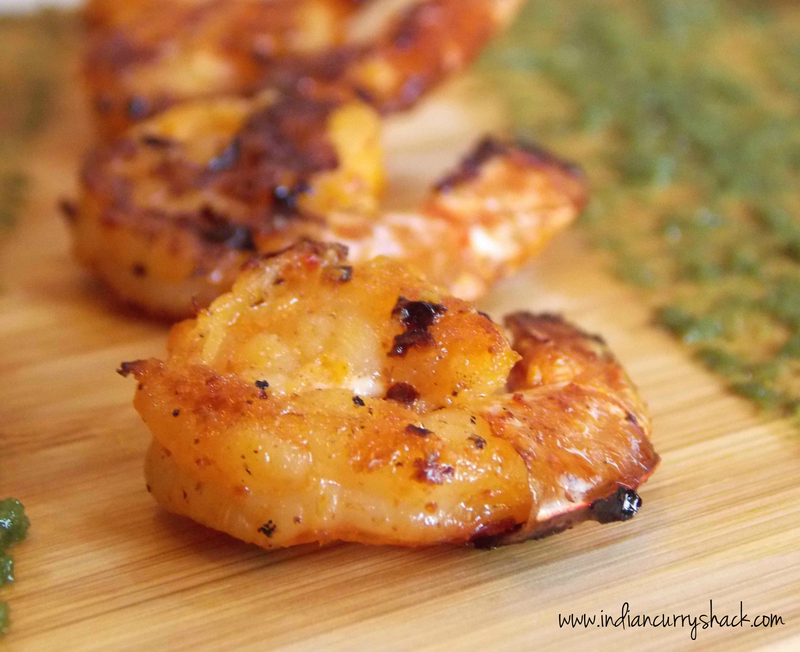 Tandoori Prawns are marinated in lemon juice, yogurt and spices, then grilled or broiled. Plan ahead. This recipe needs to be marinated for at least 6 hours or overnight. Wash the Prawns well. (I used the frozen ones so I had to thaw for 15-20 mins by putting it under the tap for 5 mins. and then keeping in a colander to strain for another 15 mins.). For the first marinade, apply salt, one teaspoon Kashmiri red chilli powder, half teaspoon garam masala, one tablespoon ginger paste, one tablespoon garlic paste and two tablespoons lemon juice over the prawns and mix well. Set aside for half an hour. For the second marinade, tie up yogurt in a piece of muslin or thin kerchief-size cloth and hang over a bowl for at least 30 minutes. Drain out the excess water and remove the thick yogurt into a bowl. Add the remaining Kashmiri red chilli powder, salt, ginger paste, garlic paste, garam masala powder, half teaspoon black salt (or chat masala), tandoori masala and two tablespoons of mustard oil. Whisk until well-mixed. A nice natural orangish-red colour marinade is ready. Then, rub this mixture well over the prawns piece by piece and marinate for 4-5 hours in a refrigerator. Remove the prawns from the refrigerator at least 15 minutes before roasting. Pre-heat the Gas-Oven Tandoor or Barbecue Grill for 5-10 minutes before cooking (very essential to get a nice tandoori flavour). Once it’s nice and hot place the prawns and cover it up for 10-12 minutes. After 10-12 minutes check the prawns. Brush them with butter, turn the side and let them cook for 5-7 minutes to get a nice smoky flavour. After 5-7 minutes, check if the prawns are well cooked. Take them out in a tray, brush them with little butter on top and sprinkle some chaat masala. Best served with Mint & Coriander Chutney, Onion Rings and Lemon Wedges. Your juicy Tandoori Prawns are ready! Get ready to relish with your family and friends.